This journal marries rigorously controlled scientific research methods with the accessibility and accuracy of real world case studies. It is designed to help scholars and academics stay in touch with current developments in the science of marketing analytics, and to help professionals working in the field of marketing analytics stay on top of the latest trends, and grasp the implications of cutting edge analytics research. 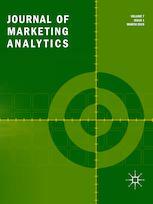 The Journal of Marketing Analytics fosters new insights into the ways that companies approach their markets, adapt to changing market conditions, and respond to new competitors. Marketing analytics powers the current wave of data driven decision-making, and strategic leverage of data remains a powerful source of sustainable competitive advantage. Data has become the new lodestone of the modern knowledge economy. In today’s rapidly evolving market, storing and reporting of data are not enough. Marketers must quickly make sense of oceans of data, and bring new insight into action faster than ever. This journal helps marketers analyze their markets, adjust to changing conditions, and respond to new competitors. The contents cut a wide swathe across the discipline of marketing analytics. Articles explore such topics as segmentation of the senior market; constructing brand value proposition statements; customer retention in B2C electronic commerce; optimizing time-limited price promotions; and more. The journal describes sophisticated analytic approaches including fuzzy-set qualitative comparative analysis and product reviews; and the use of multilevel modelling to improve neighborhood targeting.